Box needed a solution that was mobile, scalable for large budgets, and that provided clear project mapping to handle complex project plans and intricate speaker schedules. It costs Box roughly $50,000 to serve coffee for one day at a corporate event. 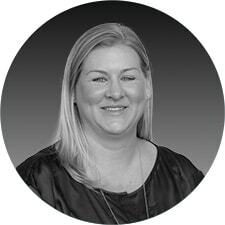 Add 10,000 people, four countries, and 39 million users to the mix and you have a glimpse of what Kathleen Castaillic, the director of global events for Box, deals with on a daily basis. Smartsheet is the tool that Kathleen uses to weave her web of budgets, schedules, and timelines, and to organize major global events like Boxworks and Box Dev, all while keeping the coffee hot. The solution had to be mobile because running events requires the team to be out in the thick of planning and not chained to a desk. The events team is lean and the solution needed to scale to manage large budgets, speaker schedules, and timelines. The solution had to provide clear project road maps to remove some of the logistical burdens from the team. It seems simple, but understanding how speakers and keynotes fit together in a cohesive and compelling way is an incredibly complex process. 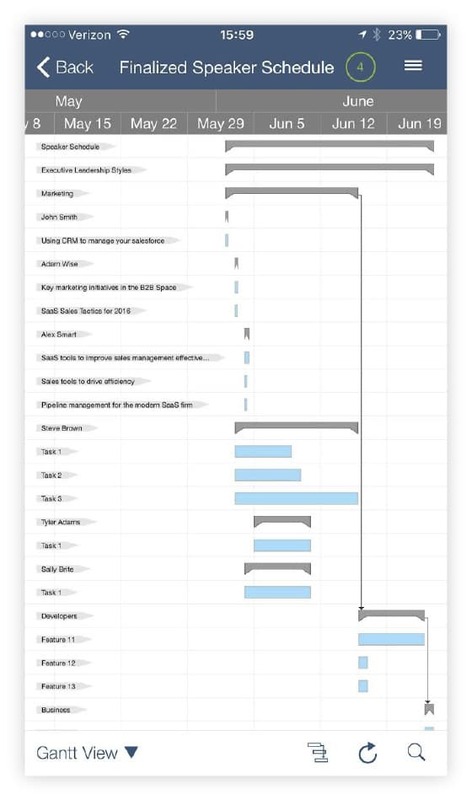 Kathleen uses Smartsheet to visualize the order of her speakers and content tracks. She can use the calendar overlay to map out her plan and attach each speaker’s content to their line item. She can also use Smartsheet’s integration with Box by creating Box Notes in a folder and then embedding the link in Smartsheet. 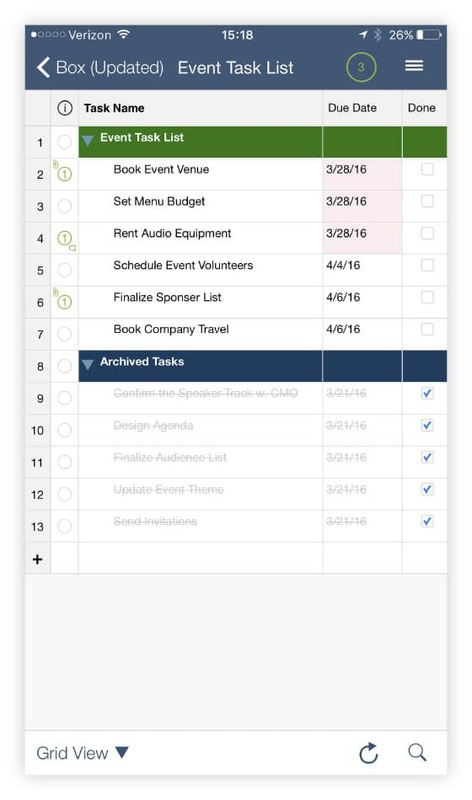 The Smartsheet mobile app on iOS gives Kathleen’s team an effective way to quickly check status and eliminates the need for timely ad hoc meetings with stakeholders. This allows her to stay in the thick of things, and have access to the most up-to-date information at any time, from anywhere. Kathleen didn’t have a way to archive the hundreds of to do list items that came up after four years on the job and five BoxWorks events. 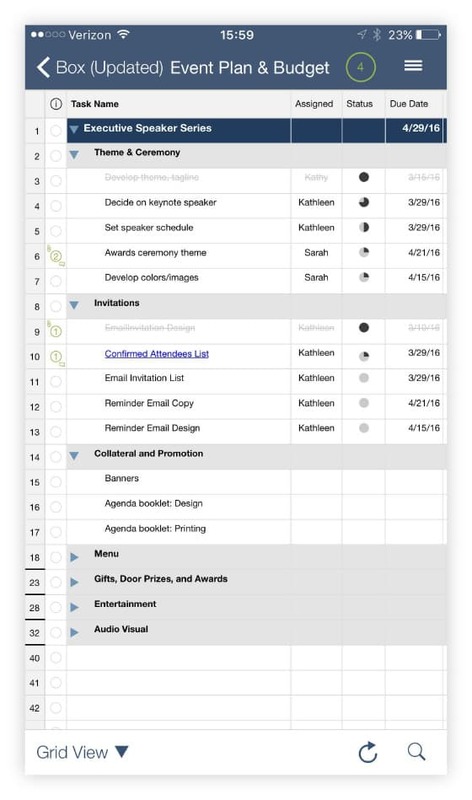 Smartsheet became a place for Kathleen to organize her checklists in a very concise manner and to archive these lists for other people to access in the present and the future. In an ever-changing discipline, extraordinary marketers rely on Smartsheet to capture their next big ideas – and make them happen.